This product is no longer available and has been replaced by: 05108-L. Designed for offshore and marine applications, the 05106 is a lightweight, robust instrument that measures wind speed and direction. Manufactured by R. M. Young, this wind monitor is cabled for use with Campbell Scientific data loggers. 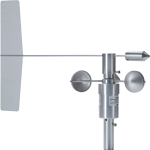 The 05106 Wind Monitor-MA is made out of rigid UV-stabilized thermoplastic with stainless steel and anodized aluminum fittings. The thermoplastic material resists corrosion from sea air environments and atmospheric pollutants. It uses stainless-steel precision-grade ball bearings for the propeller shaft and vertical shaft bearings. To make it more durable in offshore and marine applications, the 05106 has waterproof bearing lubricant and a sealed, heavy-duty cable pigtail instead of the standard junction box. The 05106 measures wind speed with a helicoid-shaped, four-blade propeller. Rotation of the propeller produces an ac sine wave that has a frequency directly proportional to wind speed. The ac signal is induced in a transducer coil by a six-pole magnet mounted on the propeller shaft. The coil resides on the non-rotating central portion of the main mounting assembly, eliminating the need for slip rings and brushes. Wind direction is sensed by the orientation of the fuselage-shaped sensor body, which is connected to an internal potentiometer. The data logger applies a known precision excitation voltage to the potentiometer element. The output is an analog voltage signal directly proportional to the azimuth angle. Life expectancy is 50 million revolutions. 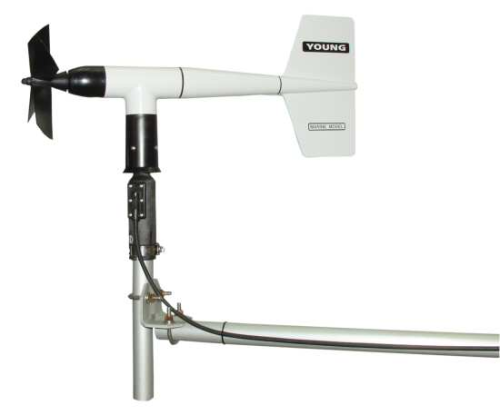 CR500 (retired) Measurements are typically processed for output with the Wind Vector instruction, which is not present in the CR500. CR9000 (retired) Measurements are typically processed for output with the Wind Vector instruction, which is not present in the CR9000. The Wind Monitors can be attached to a CM202, CM204, or CM206 crossarm via a 17953 NU-RAIL fitting or CM220 Right Angle Mounting Bracket. Alternatively, the Wind Monitors can be attached to the top of our stainless-steel tripods via the CM216 Sensor Mounting Kit. Wind profile studies measure many wind sensors. For these applications, the LLAC4 4-Channel Low Level AC Conversion Module can be used to increase the number of Wind Monitors measured by one data logger. The LLAC4 allows data logger control ports to read the wind speed sensor’s ac signals instead of using pulse channels. Data loggers compatible with the LLAC4 are the CR200(X) series (ac signal ≤1 kHz only), CR800, CR850, CR1000, CR3000, and CR5000. The 05106's propeller uses one pulse count channel on the data logger. Its wind vane requires one single-ended channel and access to an excitation channel (the excitation channel can be shared with other high impedance sensors). The 05106's propeller is measured by the PulseCount Instruction in CRBasic and by Instruction 3 (Pulse Count) in Edlog. The wind vane is measured by the BrHalf Instruction in CRBasic and by Instruction 4 (Excite-Delay-SE) in Edlog. The measurements are typically processed for output with the Wind Vector instruction (not present in the CR500 or CR9000 but is present in the CR9000X). Is a separate extension cable for a 05106-L available? The current cable is approximately 13 ft long, and it would be helpful to extend the cable another 20 ft.
Campbell Scientific does not sell an extension cable. A replacement cable can be ordered and built to the desired length (pn 05106CBL-L). This replacement cable has a connector that mates with the connector at the end of the 3 ft cable attached to the 05106-L. If the speed indicator on a wind monitor stops working, is there a part that can be replaced, or does the whole unit need to be replaced? This depends on what is broken. Typically, Campbell Scientific can repair the unit, and the user does not have to purchase a new one. If an existing wind set is replaced with a wind monitor (05103-L, 05103-45-L, 05106-L, 05305-L), will more than the multiplier and offset have to be changed in the data logger program? The measurement instructions will likely remain the same. However, in addition to the multiplier and offset, the type of pulse may change for the wind speed, and the excitation voltage may change for the wind direction. For an explanation of how the data logger needs to be programmed, see the instruction manual. 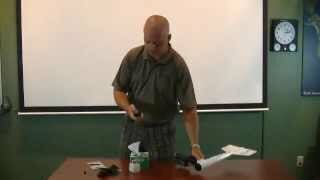 What is the power consumption (mA) of the 05103-L, 05103-45-L, 05305-L, and 05106-L anemometers? The short answer is less than 0.01 mA. The wind speed signal requires no power. The wind direction portion of the sensor only uses a maximum of 0.5 mA when excited with 5 Vdc, and then it is only on for 0.016 s for every measurement. When the wind direction is measured every second (typical), the average current drain is less than 0.01 mA. Can the output of a wind monitor (05103-L, 05103-45-L, 05106-L, or 05305-L) be changed to analog dc voltage? What is the procedure for orienting a wind monitor (05103-L, 05103-45-L, 05305-L, or 05106-L) to the cardinal directions so that the wind direction readings are correct? Orientation of the wind monitor is done after the data logger has been programmed, and the location of True North has been determined. True North is usually found by reading a magnetic compass and applying the correction for magnetic declination, where magnetic declination is the number of degrees between True North and Magnetic North. Magnetic declination for a specific site can be obtained from a USFA map, local airport, or through a computer service.